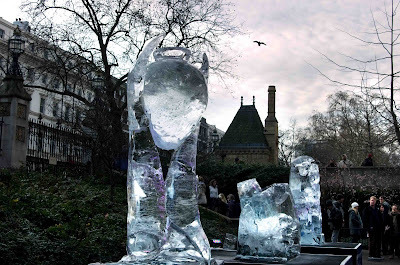 London's first ice sculpting festival took place in front of the Natural History Museum over the weekend. Giant blocks of ice (weighing 2 tons a piece) were carved into amazing sculptures. Smaller blocks were used for those keen to learn this craft. Obviously an ideal time for this festival! What fun! It's amazing what they can do with a big block of ice! is it so cold in London that the sculptures get stay? Did you have a go?! Nice angle for the photo. With the birds and the chimney pots your photo put me to mind of Bleak House - but I digress. I think there is a major ice-carving festival in Shanghai each year that we in Australia get extensive coverage. It lasts for quite a few days. I don't imagine that the London sculptures lasted very long at all. Not an easy thing to do, I would image: to carve ice! I wish i wax there ,i love it !